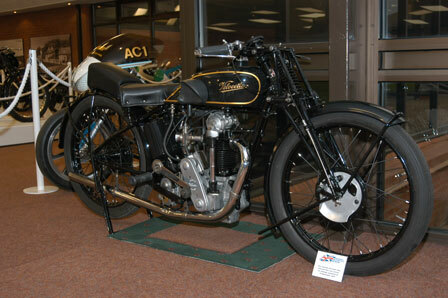 Velocette's prototype overhead camshaft engine was built in 1924 and developmenet work carried out over the next year resulted in ther first TT win in 1926. To quote from Ixion "1926 was to be the canonisation of the ohc 350cc Velocette product of a small firm dabbling in two-strokes and producing about a dozen bikes a week". Alec Bennett was the winner with Gus Kuhn and Fred Povey finishing in the first nine to give the factory the team prize.A great achievement for a firm with no racing department and a total staff of only 42 workers. Further work on the KTT model resulted in the first positive-stop foot change in 1928, part of the mechanism believed to have been inspired by the ratchet device on a German machine tool in the factory. Another innovation on the 1929 model was the strutted front fork, originally designed to withstand side thrust from sidecar racing. It was a very strong fork, not easy to bend but equally difficult to straighten if bent.The production racing KTT was to be one of the most usccessful Junior machines of all time and many famous names started their racing career on this model. An example of this being Freddie Frith who was one of the first six in the 1930 Manx grand prix, all six being on Velocettes.